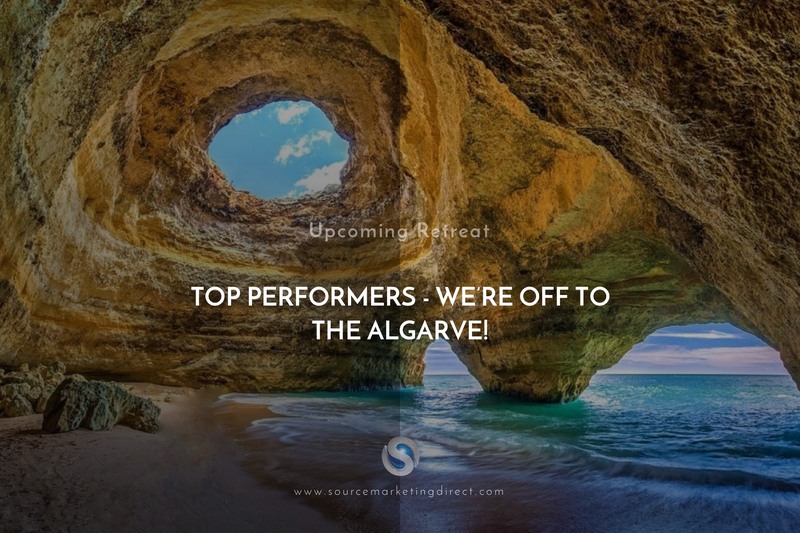 Source Marketing Direct are delighted to confirm that next week on March 28th we will be taking some of our top performers to the Algarve, Portugal for 3 days! We’ve seen how reward culture is a big hit with Millennials and Gen Z’ers, so we have created an itinerary for the retreat that we believe won’t just match, but will surpass their expectations. Our Managing Director Hector Montalvo plans to take the group to experience a couple of hidden gems – including the Benagil sea cave grottoes or the Algar de Benagil. Reachable only by sea, it remains one of the most spectacular places in Portugal’s outstanding coastline. While there will be plenty of ‘downtime’ to chill at the hotel pool, or by the beach, there will also be seminars, networking, and team dinners. As a company, we don’t necessarily believe in the traditional concept of striking a ‘work-life’ balance. This is because the average person spends more than 90,000 hours in their lifetime at work – entrepreneurs and those striving success, even more so. Therefore, you should love what you do, as it ends up forming such a big part of your life. We would prefer to use the term ‘reflection’ or ‘refocusing’ when discussing breaks we have from work. We find these are important, and allow us to return to work feeling rigorously ready to attack our problems standing in the way of us achieving our goals. Source Marketing Direct believe big problems don’t get solved while you’re busy running around your day-to-day – you need to take time to reflect and learn. Retreats like this offer great thinking time, allowing you to free your mind of the smaller day-to-day operational details, phone calls and emails so you can reflect on some of the bigger issues you’re dealing with! Sometimes speaking and networking with others – bouncing ideas off of one another in a relaxing environment serves as the perfect tonic. After all, you’ll get to where you want to be much faster with a support network around you. To those reading who are joining us – start packing! Previous Previous post: Source Marketing Direct: Get stuck in execution mode.